The pearlized mineral sheen is suspended in an ultra lightweight, easily absorbed infusion of the world's most nutrient-rich botanicals. This highlighting makeup is a treat for the health of your skin and what we hope will be a highlight to your day. Afternoon Delight  imparts a peachy-pink golden glow  as if you might have been up to something naughty. The Happy Hour  imparts a cool-toned pink radiance  as if you are radiating with joy. The Golden Hour  imparts a warm, golden, champagne-like radiance  as if you are lit by candlelight. After Hours  imparts a bronze-golden glow, gilding the skin with a believable sunlit sheen, ideal for a beach-y summertime look. Place a couple drops of our highlighting serum anywhere you would like to accentuate with a luminous, healthy and natural-looking radiance. Apply alone, over your makeup or add a drop or two to your existing foundation. Please be sure to shake well before usage to ensure the perfect distribution of pigment. The highlighting serum has a slight pleasing citrus aroma. The Highlight of the Day uses the highest quality natural, organic and wildcrafted ingredients from conscious growers from around the world. 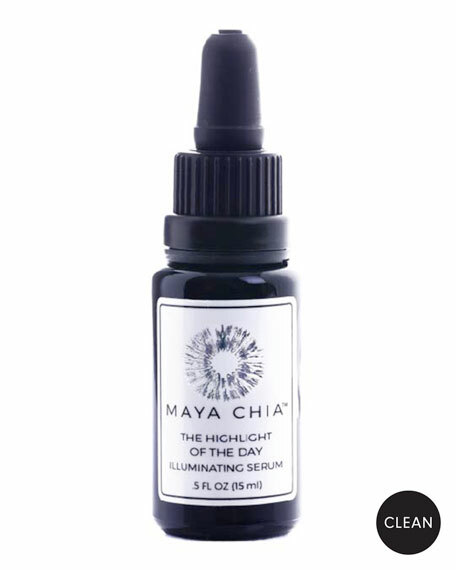 Our highlighting serum is never formulated with parabens, phthalates, synthetic fragrances, PEGs, and SLSs. This clean beauty brand uses natural, organic, and wild-crafted ingredients to create chia oil for a variety of skincare products. Maya Chia's patented extraction process results in oil that is without chemical residues and impurities.